You are readingWill the PS4 Beat the Xbox One? 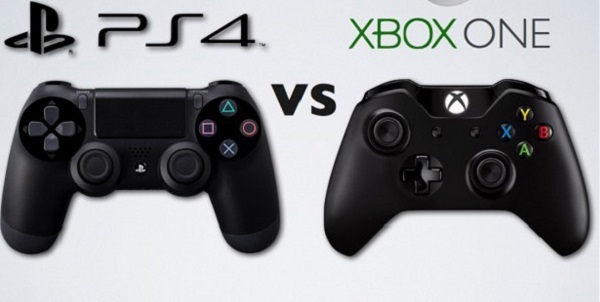 Pitted together in the war of next-gen consoles, Sony and Microsoft are going toe to toe again with the PS4 and Xbox One, but will the PS4 come out on top? It’s a battle as old as time, Sony vs Microsoft. For as long as the two technology giants have co-existed, they’ve been competing against one another. However, never had the fight been so fierce until Microsoft entered Sony’s stomping ground of video game consoles. And with the Xbox 360 vs PS3, Microsoft seems to have won too, but with the Xbox One and PS4, Sony looks set to get its crown back. For one, it seems that the very ideologies of the two consoles are very much different. Made clear in the recent Microsoft and Sony pressers, revealing their next generation consoles, the former is setting theirs up as a multimedia powerhouse while Sony’s is being wagered as a pure gaming box. Straight off the bat, this has set the Internet alight. Many are arguing that they don’t want ‘a glorified set-top box’, as they’ve labelled the Xbox One, while others are willing to leave indie titles in the dirt as the PS4 seems to hold them with high regard. What’s clear is that the two are going after different kinds of consumers (one that wants everything in one package vs one that wants the very best in gaming on one piece of hardware) and it’s this that could set the two apart in terms of sales figures. And if the PS4 and Xbox One look to be dividing gamers, then this is something that hasn’t been lost on investors and shareholders either. Not long after Microsoft revealed the Xbox One, the company’s shares plummeted, with Sony’s stocks rising in popularity with all the vigour of a heavily publicised startup. 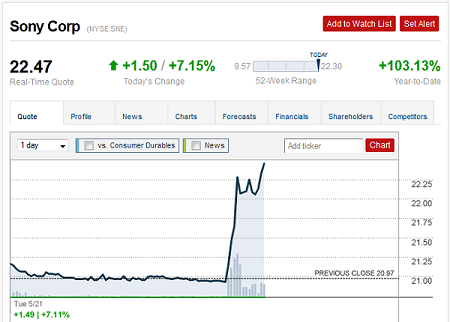 If you look at the image of the then stock prices (pictured above – the Sony shares are on GMT) you’ll see just how badly Microsoft appears to have garnered appeal. It’s no wonder that Microsoft have dropped significantly in gamer opinion polls too with their decision to focus on entertainment over all else. In their debut reveal of the Xbox One, only four games were showcased. All but one, Quantum Break, the new, exclusive title from Alan Wake developer, Remedy, were multi-platform and will too be coming to the the PS4. FIFA 14, Madden 25 and Call of Duty Ghosts, all shown off at the Xbox One reveal, are even going to be released on Xbox 360 and PS3 too. So while Microsoft claimed that their console will feature 15 exclusives within its first year of launching (that they are reportedly spending $1 billion on developing), the one that they did actually show off (of which information and trailer footage was rather paltry), that claim doesn’t seem up to snuff. 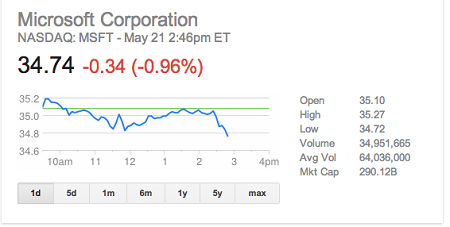 The Xbox One and PS4 are too trading bullets on the frontlines in terms of their similarities. While the PS4 very much trumps the Xbox One in terms of specs (the Xbox One has 8GB DDR3 RAM with 1.23 TeraFLOPS capability in its GPU while the PS4 has 8 GB GDDR5 RAM and 1.84 TeraFLOPS, making the PS4 perform around 120% faster), the back of the box features are quite the same. One of the biggest features is that both have gameplay recording capability, with both companies showing this off in their pressers. With the PS4, you can share footage or even livestream (via UStream) with one click of a button (the updated Dualshock has a dedicated button for it), while Microsoft were unclear when they stated that recorded footage would only be available through Xbox Live. Both have fancy camera tech in the Kinect sensor and the PS Eye. And, in somewhat of a thorn in Microsoft’s side, the PS4 will offer up almost as much entertainment streaming as the Xbox One, putting a dent in their efforts to position the Xbox One as the ultimate in entertainment. While the two will likely stick together closely, even in release windows (the Xbox 360 proceeded the PS3 by over a year, causing many to say that’s why it “won” the current generation), ultimately when they both go on sale, the gamers will decide. But for now, with the PS4’s superior games and its soaring popularity amongst gamers, who are looking to do what they do best : play games, the Xbox One is going to have to do much better than say “anything you can do I can do better” to hold onto its crown, it’s actually going to have to prove it.